I’ve had this card for over 6 months, and I get so baffled every time I think about it. 200GB in a microSDXC card! That’s just ludicrous! Every time I think about what I could do with this card, I kind of freak out. It shouldn’t really surprise me in this day and age, but I can’t help it. A little tiny chip, the size of your pinky fingernail that weighs as much as a paperclip, can hold more than a base model MacBook Air or Pro and the top of the line iPhone at 128GB right now! Really, that’s ridiculous. With this kind of storage, many people can store their whole digital life on a miniature memory card– including a whole operating system. Your accountant, office manager or even business marketer could probably be one of these people. With a write speed classification of Class 10 and a theoretical read speed of 95 MB/s, this card isn’t a slouch (more about Class speeds here) and should be capable of adequately functioning in most standard applications you apply it to. I’ll see what I can get out of this card in terms of write speed and read speed on my MacBook later. So it’s made by Lexar–to me, a leader of luxury. 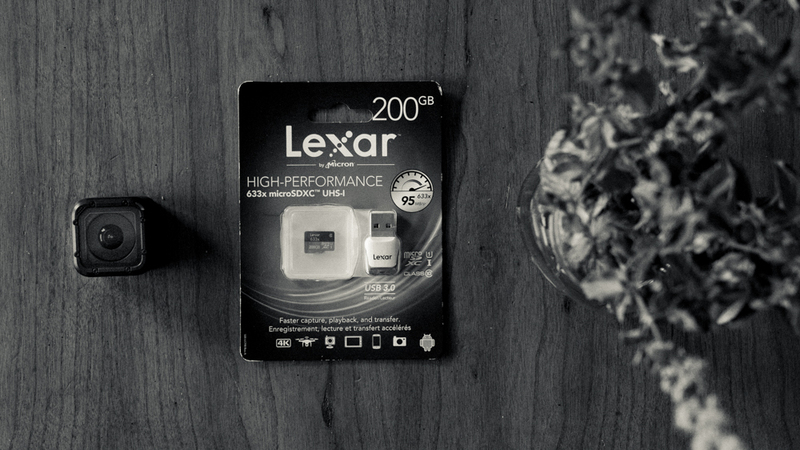 Lexar has been dang good to me for reliability and even with such a great reputation, they’ve decided to back that up with a lifetime warranty on this specific card. Pretty sweet, if you’re asking me. Also, the little included USB 3.0 card reader has a one year warranty as well– a pretty sweet add-on which makes this specific package a no-brainer for those who are looking at the current competition for the price point. I’m not a super crazy video person, but I sure could get out there and start filming everything and anything, with this much space. I’ve got an affordable GoPro Session, which does 1440p HD video, and it’s showing me a ridiculous amount of capable recording time. Well, it’s easy to say that the amount of footage that I can take with the GoPro with this card will very well exceed the battery life of the GoPro several times. When I first put the card in, the GoPro App on my iPhone showed me 17 hours worth of video that could be taken. That is a whole freakin lot of video! Put this GoPro with this card in the air on a drone and you wouldn’t have to worry about storage for the whole session of filming. Pretty impressive! If you wanted to use this card for time lapse photography, you’re definitely going to need some external battery power to keep this going to fill up this card. I’m sure you could let this thing run for a day or so non stop while it records the pictures onto the card. Just take a look at what the GoPro app said it could hold for 8MP still photos! That makes me laugh on the inside. 55982 jpeg photos. Haha. I would never have that many photos on a card, but it’s neat to know that I could if I ever wanted to. Back in the day of my first real college laptop, a 2010 13″ MacBook Air, storage was really quite limited. I opted for a little aluminum-faced microSD adapter that fit flush into the SD card slot of the MacBook Air called a NiftyDrive. At that time, the base amount of storage you could get was 128GB, with the max being 256GB. I opted for the 128GB model and ended up getting a $200 32GB MicroSD card for the NiftyDrive, which cost around $70 at the time. Kind of crazy. Lexar’s little SD card right now is just a tad bit more than what I paid for the NiftyDrive, which is pretty dang competitive! If a 2016 MacBook with Retina Display, my current portable machine, had a built-in microSDXC card reader, I’d shove this little card in there in an instant– I’d have a total of 450GB on such a little portable machine. Seeing that the initial storage space for the entry level MacBook Air and Pro lines are still 128GB, grabbing this Lexar 200GB card could really expand your storage and provide a solution to help archive photos or a place for your Dropbox folder to live, or even a crazy little way to do a Time Machine backup contained on your machine. Some people I know have used it just to hold their iTunes library– each to their own, it’s all useful anyway. Of course, if you go this route and typically use the built in SD card reader, you’re going to have to switch over to the USB method of getting your images onto your computer. Do your research on these solutions though, a lot has changed since I have done it in this day, but using the SD card as a storage solution is something that is still relevant for many users out there. I tested this little card with my 2016 MacBook with Retina Display configured with the Intel m7 processor using Blackmagic’s Disk Speed Test. I’m utilizing the USB-C adapter made from Apple coupled with the included USB 3.0 microSDXC card reader that Lexar provides with the card. I’ve also tested this card using my 2013 Mac Pro via Lexar’s HR2 Professional Thunderbolt Hub and found the differences quite minimal- I did a test between two UHS-II Cards with that Thunderbolt reader in a shootout. With write speed that is just under half of its read, this card is very capable in most applications. It has provided me with fast enough scrubbing directly off the card from the GoPro videos that I took with it and file transfers were quick. This card definitely has value in its capacity, performance and warranty. I’d probably say that the best usage of this card would be definitely for video, even though you could get away with taking a ridiculous amount of Fujifilm X-T1 RAW files on it –roughly 8.6K of them. And with option of shoving this tiny card into your MacBook or PC for additional storage space, this card really can be versatile. I’m sure someone could find other uses for 200GB of portable storage. Lexar says that this little guy can hold 17hrs of video, 33,000 pictures– presumably compressed jpeg, but not sure at what resolution though–, and 28,000 songs. Really though, how would you utilize a card like this? Let me know– obviously I’ve only got a few ideas.